The Rabbi with a Blog (Rabbi Jason Miller): Pimp My Purim Shpiel! "Why isn't your Purim Spiel funny?" 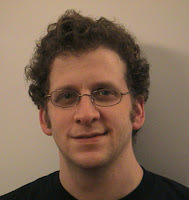 asks Rob Kutner (pictured) on his 'Shushan Channel' website. Kutner is a writer for "The Daily Show with Jon Stewart." He continues, "Jewish people are the funniest people in the world. So why are most Purim spiels [their spelling... I use "shpiel"] so lame? We're not sure, but we decided to fix the problem. Enter "The Shushan Channel." The Shushan Channel offers to raise the bar on Purim by providing original, topical and hilarious Purim shpiels created by top comedy writers from New York and LA. These shpiels can be used by synagogues, Hillels or JCCs and are guaranteed to make people laugh. From the website you can look at sample sketches and read reviews from congregations who have used The Shushan Channel in the past. I watched the sample sketches and they are pretty funny, but even with a good script it is still critical to have good delivery and comic timing. Most Purim shpiels are so bad, however, that at least with some professional comedy writers there is bound to be an improvement.